We are family. I've got all my sisters with me (well, not really, Urlene and Kathy are not here, and Greg is...but that wasn't part of the song!) Anyway, here we are Sunday in Monica's living room: John, Teresa, Greg, me and Monica. Colin and Shane were busy with the x-box. Tim and Tabetha. He's just graduated from High School and he's a concierge at a local hotel - he's got it goin' on! Sami and Farid warming up before the game. Cute, huh? Run, Sami, run!!! We won! Again! Here is my room in "the Villa"! Lovely, right? What fun to be here! I could get used to this! And here is the view from my balcony! Bet you wish you were here with me! And, the upstairs living room. Remember this place? I know that at least Tamar and I slept here on the floor for the family reunion - there was no furniture at the time! This is the improved version! I can't believe it has taken me 7 years to get back here! That will NEVER happen again! Friday was mystery reader day - Monica dahling was the mystery reader in Caki's class, so we had lunch with the twins first, then off to the classroom for reading "Fancy Nancy". Monica even brought 4 of the gaudiest, sparkliest rings I've ever seen, so she could wear them while reading the 'fancy' story! It was great! Monica was the consessions lady at Sami's game Friday evening. I thought she looked lovely there, even though she wasn't wearing her fancy rings for this job! I did help her with fixing the drinks for the team for after the game - they won, by the way! Here is Caki with her package of Doritos. She knows how to watch a baseball game - get a snack and walk around visiting all of your friends, and all the people who are walking friendly-looking dogs! The time just zips by! Farid really tried to let us be in charge of taking the pictures, but after only 3 shots, he asked for the camera for himself so he could get some good ones. Here he is taking a picture of me taking a picture of him! As soon as I get Farid to download the other pictures I've taken, you'll see 'the villa' where I'm staying - it's WONDERFUL - and pictures of Saturday's game, and lots of other fun stuff! I'm really enjoying myself here. I don't want it to end. I love you all! In order to get our grandchild 'fix' for the month we borrowed little Violet for the day Saturday while her mommy and daddy were moving to their new home. Her mom is my masseuse and needed a little help since Violet thought she was in charge of a little too much of the moving process! 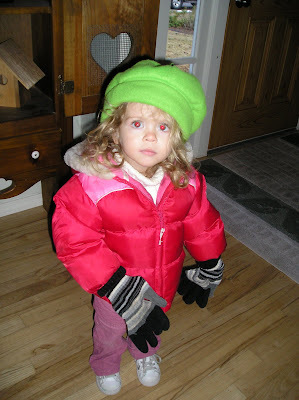 We needed a little grandkid time, and she had started calling me grandma on Friday - and even volunteered to let me change her diaper during dinner - so how could I refuse? 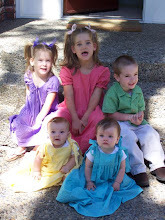 We had a great time, and the move went smoothly, so it was a win/win/win for all of us! 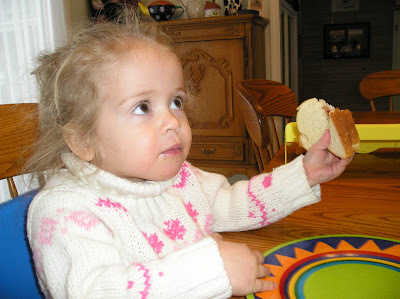 Here is little Violet eating her lunch of peanutbutter and jelly, apples, oranges (she really liked oranges) and cottage cheese. Only one thing on the plate at a time, though! 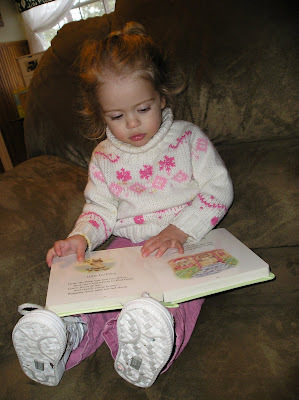 Another interesting habit is for her to taste and then spit out the first bite of EVERYTHING and then go right ahead and eat all the rest... She loved to read, but only for short snatches at a time. 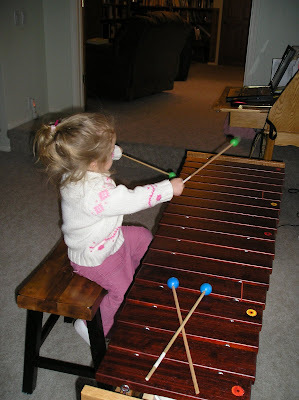 Jammin' on the marimba was a hit - in more ways than one! 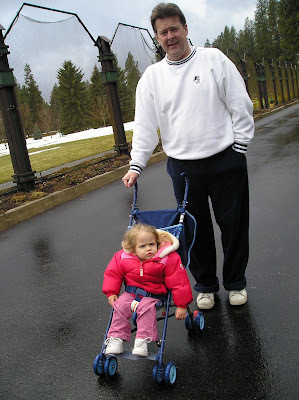 She really enjoyed the walk with Grandpa! Outside is a favorite place for Violet. 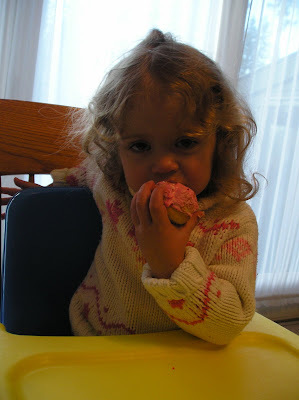 But, after a long walk, and an even longer nap, a girl can work up a healthy appetite, so we needed a little cupcake time! Well, I know I'm really trying for favorite gramma here, but I will do it with my head held high! Most of you know that I've started taking Spanish lessons. Well, the first teacher moved back to Mexico recently, so we had to find another teacher... He happens to live about a block past my back yard, he goes to Hayden 2nd ward, AND he has a 3 year old son named DIEGO! He even looks like "Dora's" brother! Of course, he speaks fluent 'kid' Spanish! I just know that my grandkids now think I know someone famous! I'm sure he'd love to play with them whenever they come for a visit! But don't forget to visit Grammie Jammies, too! Well, this afternoon, after a half day of elementary music and some asprin for my headache, I signed the paperwork for selling the house. Don't panic - we won't end up out in the street! We have a clause that says any offers are contengent upon us getting the house we want before we agree to sell! I've got writer's cramp from signing so many forms, but let's all pray that this time the $575 K selling price will actually be enough to buy Sam's house and get us out of debt! (Big hint: Sam needs to get a little more realistic about his asking price of $495....) Anyway, that's the news. I really do like this big, old house. It has been a great place to live, and it would have been nice if we could have kept it long enough for one of you kids to buy it, but it looks like that won't be happening. That's ok. Now none of you will feel obligated to buy it! I'll keep you posted on how it all goes!